As a school kid I had a daydream about my ideal horse. He was a dapple grey gelding with a touch of Percheron and his name was Charger. Well fast forward many years and in the cattle yards at Rocky Springs he stands – only there is more than a touch of Percheron and his name is Clyde. Well the name was the first thing that had to go – we couldn’t have two Clydes, and as Charger may have been asking for trouble, he became Percy Plod. He is indeed a gelding, well over 16 hands, dapple-grey tending to white, feathers on his fetlocks and feet like dinner plates. My teenage self just fell in love. Percy hails from the hills of Braeside and we had him on trial from friends Sue and Grant. My first ride on Percy was to muster Creek Paddock, with Brian on Cobey and a few dogs thrown in for good measure. Perc went up hills like he had a V8 motor, had no worries plodding through our only swamp and, other than a few fidgets when I first got on, was a well behaved animal. A couple of days later I took Percy out on my own. We walked along the creek, enjoyed the sun upon our backs and meandered amongst dozing cows and calves. I was off and on regularly to open and close recalcitrant gates and on the way home dismounted once again. Then on the re-mount when I was in no-man’s land – one foot in the stirrup, one foot in mid-air, arse hanging sideways – Percy shied. There was a blur of movement: my legs, his legs, a big grey shape, me falling backwards and tumbling onto the ground, horse gone. Instinctively I tried to stand. I attempted to walk then fell to the ground again as the pain started. I remember a hockey player saying to me when I snapped the ACL in my knee – “breathe through the pain”. And so I breathed. After an indeterminate period of time I sat up and assessed: sore finger (nail bent back by half), prickles sticking out of everything and a severe cramping pain in my left leg. I stood, took a step, the earth spun. I landed back amongst my prickles, clinging to the ground. Then began an internal argument. “I’m going to get up, catch that horse and ride home” said one side of my brain. “Actually I think you may have to ring Brian” said the other side. “I’m definitely not ringing Brian”. “This time you might have to”. “No”. Then I stood again, the earth spun again, I crashed again and out came the phone. Luckily Brian was at the other end of the paddock on his bike and he soon found me amongst the burrs, thistles and prickles. “Pull your pants down”, he demanded on learning where the pain was worst. “Huh,” I thought. “Pull ‘em down so I can see what you’ve done” he clarified. Slowly I edged my jeans down and not finding anything that impressed him, General Tough Love turned me over. Did I mention the burrs, thistles and prickles? Well not only were they in my exposed arms and hands but now well embedded in my thighs and bum. Again I waited (head downhill) for the spinning to pass, then I stood, took Percy from the General and hobbled him 50m through a gate. Brian legged me aboard again and though the earth had stopped spinning the pain was excruciating so after about 200m I slipped off for the last time. I stood there forlornly about 2km from the house. General Tough Love came up on his bike and directed, “You’ll be right to walk home won’t you? It will do you good” and in a cloud of dust he was gone. So I started for home, limping badly on a very painful leg, feeling very ordinary and with a horse following obediently while nibbling on my hat and asking “Who are we calling Plod now?”. The General must have had a change of heart because ten minutes later he turned up with the ute and I was transported home to lick my wounds. My leg feels torn and stretched and has developed the most spectacular black bruise from my bum to the calf. The doctor has me on anti-inflammatories and time, I hope, will heal all the damage. My hands look like I have the measles as all the prickles redden and fester. The nail is mere collateral damage. I still don’t really know what happened. There was falling and legs. Maybe I momentarily had my foot caught in the stirrup. Maybe the horse stepped on me. Maybe I was concussed. I don’t know. So I guess Percy will be re-named Clyde and be sent back to Braeside. At least he has a ramble named after him. The search for that elusive horse to replace Bandit and Desley goes on. 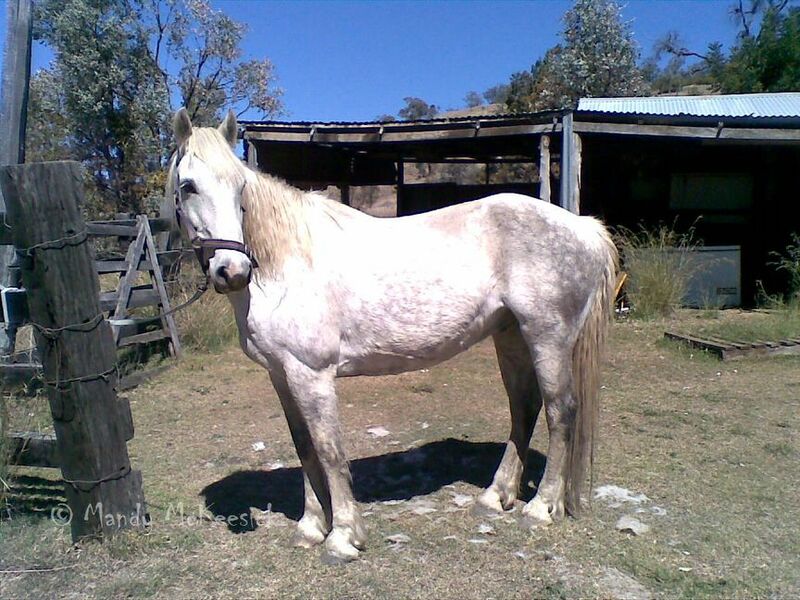 This entry was posted in Equines and tagged australian farm life, horse fall, Percheron, stock horses, torn hamstring. Bookmark the permalink. Good spotting Julie! You breed ’em tough in NZ, so I’ve pretty much got to look after myself! I knew I had a serious injury one day when working in the cattle yards. A cow kicked a gate into my face, blood everywhere and Tough Love was concerned – “Go and sit in the ute ’till I’m finished”!!!!! Nothing like a nasty fall to kill a dream. Tough break. I still look at that photo of Percy, Lyle, and think what a beautiful animal he was. I wish the relationship had worked out better. Percy’s a handsome fellow. Horses are beautiful, but they sure can damage a body, being so much bigger than we are. Mine fell on me in the winter while trail riding, back in the pre-cell phone era. No snow on the ground, but a patch of frozen ground and a misstep. No choice but to haul myself up on a rock that was conveniently in the area, slide over on his back and ride him home. Broken ankle. Horse only had a scratch. I was a lot younger then. Rode up to the stable and banged on the window. That put an end to marathon training. Mandy hi, good to be back here! Similar thing happened in May to my well-into-midlife daughter in a side-leap by an oh-so-sweet (BIG) paint. She hit ground in a V, was trundled via manure scooper with fractured pelvis 2 places & like you, BIG hematoma to the bum. Horse is in reminder training, she’s just now off crutches & trails have to wait until spring. Please send her my commiserations and my empathy. Ouch.